On Wednesday MLS commissioner Dan Garber and Atlanta Falcons owner Arthur Blank together announced the beginning of association football in Atlanta. Name for the future club isn’t known yet, but its identity will most likely include red colour, fitting the club’s future stadium and linking it to the Falcons. Talks about this franchise had been ongoing for months. While the club is yet to be established, its stadium design is already in place. 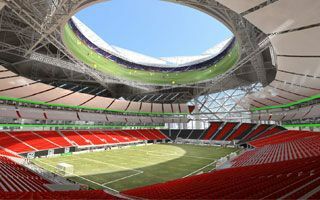 The new Falcons Stadium by 360 Architecture was planned in a way to enable downsizing for smaller events, of course also fitting the wider football pitch too. With special curtains upper tiers of the stadium become hidden and allow to avoid the feeling of empty stadium for less popular MLS games. Single tier around the pitch should still hold over 20,000 people, while the full NFL layout offer 65,000 seats. A few months back commissioner Garber described this downscaling solution as revolutionary in the world of sports, but this isn’t exactly the case. Similar solution is already in place at another MLS stadium, the BC Place in Vancouver. Also, recently opened Friends Arena in Sweden may hide its uppermost tier completely when not needed.